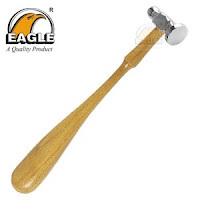 Eagle Chasing Hammer is very handy Gold Smiths bench tool for striking chasing tools or Planishing metal. The other end is for riveting and metal designing. The head is forged and mounted on curvy wooden handle for perfect grip. The face diameter is 1". 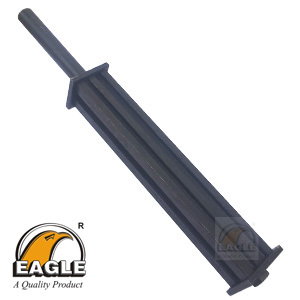 Presenting Eagle 8" solid Ingot Mold for molding wires out of molten gold and silver. 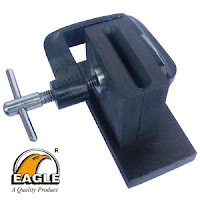 This square Ingot Mold machined on 4 sides to make 8" long wires with 6 different Thickness, 3.75" long handle attached for convenient and safe handling. Overall length of this jewelry making tool is 12.25". 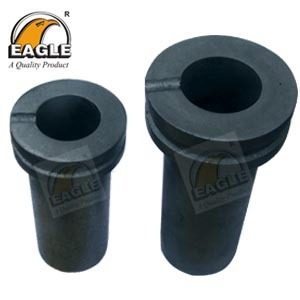 Eagle Graphite Crucibles are made of Super Fine Graphite Material and very ideal for melting gold and silver in Compact Size Melting Furnaces. Two different models available to hold Gold/Silver up to 1 Kg and 2 Kg. 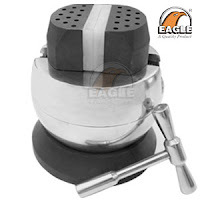 Fine grade Graphite Material ensures the durability in terms of number of melting batches. Grooved collar has been designed for safe handling while pouring the molten Gold/Silver. This Eagle Engraving Block is very ideal Jewelers Tool to set comfortable work angles. It has very accurately made deep jaws which moves very smoothly to adjust them according to requirement. 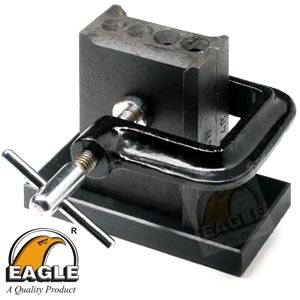 Heavy duty rubber base grips it accurately and hold the engraving block inperfect position as it has been set by user. Gold Testing Stone is very handy to test gold by using test acids. 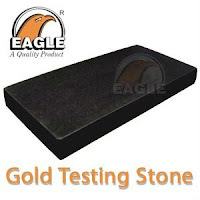 We are supplier of Gold Testing Touch Stone. We process Natural Gold Testing Stone in India and supply Gold Testing Stone in different sizes to determine the Karats of Gold Ojects and Articles. Presenting Eagle Ring Expander for resizing jewelry rings. 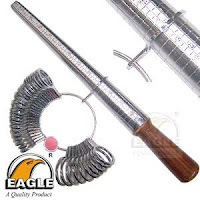 We are manufacturer of this Two in One Ring Sizer, in India, which is very useful jewelry tool to Enlarge and Reduce Ring Sizes. 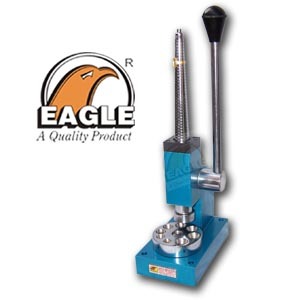 Our Ring Enlarger & Reducer is available with 1 to 36 and 1 to 15 Size Measurements. The reversible base plate has 16 countersunk dies which will allows for reducing without making scratches on rings. Presenting convenient tool for recycling precious metal scrap. This Reversible Ingot Mold is to create usable shapes like Round Wire, Half Round Wire and Flat Plate or Sheet. We are supplier of this Reversible Ingot Mould in India. 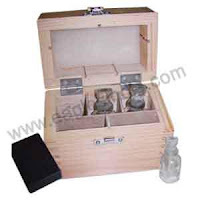 This 5 compartment Eagle Gold Testing Kit contains one Gold Testing Stone, 3 Glass Bottles for storing Gold Testing Acids and it has an empty compartment to keep safe the Needle Set. This Kit comes in Premium Polished Wooden Box. It is also available with 8 compartments. It is used to ensure the carat value of Gold Articles. 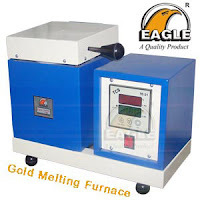 Eagle Digital Electric Gold Melting Furnace is very useful for melting Gold, Silver, Copper, Brass and other metals with melting temperature less than 1100°C. However, it can be operated up to maximum 1150°C (Continuous operations at maximum temperature reduce the life of Heating Element). Eagle Gold Melter has Digital Display to set and control temperatures. This Digital Electric Gold Smelting Furnace is an ideal supporting unit for Jewellery Casting, Gold & Silver Refining, Alloying, etc. It is Available with 1 Kg. and 2 Kg. melting capacity. This melter is well designed for easy and safe operating, rings alarm when reach the desired temperature set by operator. It is constructed with Heavy Duty MS Material to ensure durability. This Electric Gold Smelter comes with a High Quality Graphite Crucible, Crucible Holding Tong, Graphite Stirring Rod and Safety Gloves (Optional). We are manufacturer and supplier of Digital Electric Gold Melting Furnace in India. This Eagle Combination Bench Pin and Anvil is very useful tool which can be clamped on Jewellers Work Bench and provides convenient base. 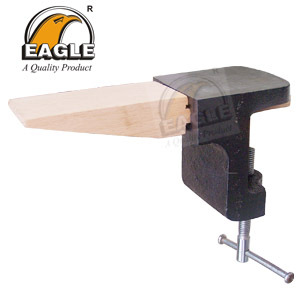 It has well finished flat anvil block and replaceable hardwood Bench Pin. This compact Jewellery Tool is very useful for Flattening, Filing, Sawing, Hammering, etc. This Disc Cutter Set of 7 with Round Base is very accurate in cutting round discs. 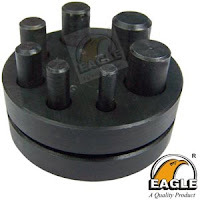 We are manufacturer and supplier of Disc Cutter Set with 7 punches in India. 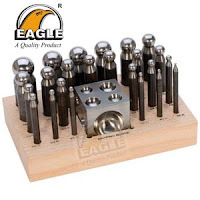 This Eagle Brand Disc Cutter Set has 7 Punches, the sizes are; 1/4", 5/16", 3/8", 7/16", 1/2", 9/16", 5/8"
We manufacture and supply Wide Range of Jewellery Making Tools. Our Jewelers Rolling Mill is equipped with 76mm wide and 43mm diameter Tempered Steel Heavy Duty Rollers. 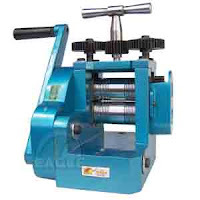 The Rollers can be altered easily for different operations such as to make sheets of different gauges, Wire making and also for designing work with the pattern rollers. It guarantees excellent performance and durability at very affordable prices. Made in India. 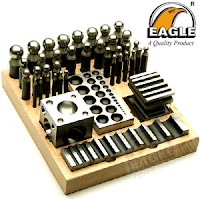 Eagle Industries operating business as a manufacturer and supplier of Jewelry Tools, Equipments and Consumables in India. Since its inception, Eagle is continuously emerging as a well trusted Brand in Jewellery Tools and Equipment Industry in India. Being a manufacturer, we are using Innovative Technologies for edge of perfection in Production Processes at our two storey factory in the city of Rajkot. We are famous among merchant traders of Jewellery Tools & Equipments in domestic market and also among jewellery manufacturers across India. With the long experience in Jewellery Tools Industry, we have potential to supply all types of Jewellery Tools, Equipments and Consumables under one roof. Our group company Eagle Exports has also reflected the international competitiveness and trusted global image and now we are stepping ahead as an exporter in almost all continents across the globe.